Personal Selling and Sales Mgt. * Brand & Product Mgt. Note for teaching experience: An “*” above preceding the course name indicates prior nomination(s) for teaching awards. Director, Michael Beshara (2002), Arizona State University, Honors College. Third Reader, Nermine Mansour (2001), Arizona State University, Honors College. Weatherhead School of Management, Case Western Reserve University, Executive Doctorate of Management (DM) and PhD program, numerous students, 2011-present. 2013 Nomination for CWRU Teaching Excellence Award for MBA marketing core course. 2012 Nomination for CWRU Teaching Excellence Award for MBA marketing core course. 2012 Nomination for CWRU Doctoral Teaching Excellence and Mentoring Award for a PhD course on structural equation modeling. 2011 Nomination for CWRU Teaching Excellence Award for MBA marketing core course. 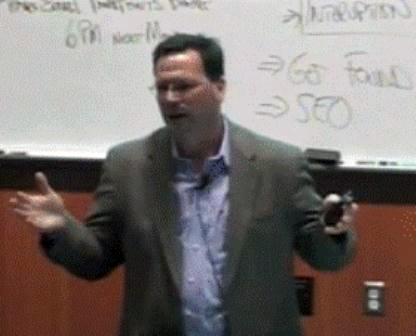 2010 Nomination for CWRU Teaching Excellence Award for MBA marketing core course. 2008 Nomination for CWRU Teaching Excellence Award for MBA marketing elective courses on both brand management and business marketing. 2008 Completed “Teaching Negotiation to Senior Executives,” Harvard Program on Negotiations. 2003 Nomination for John W. Teets Outstanding Graduate Teaching Award, W.P. Carey for MBA marketing core, Arizona State University. 2001 Completed “Teaching with the Case Method,” Faculty Workshop, Harvard Business School. Note: Student ratings are shown on a 5-piont scale; 5 represents highest rating, while 1 represents the lowest rating; reverse scored where appropriate for consistency across university faculty appointments. Instructor ratings at most recent faculty appointment (Clemson University) average 4.24 for graduate and 4.48 for undergraduate level courses. Gary, during class, while teaching the MBA core marketing course during Fall 2012.